Islamabad: Exoplanets offer a chance to teach scientists about how worlds are born. The recent explosion in exoplanet discovery has led to a wide array of planets, all showing different pathways to formation. Analysis of a new discovery known as Kepler-107c offers something never seen before: a planet comprised mostly of iron, what scientists estimate could be as much as 70 percent. Scientists from Italy’s National Institute for Astrophysics (INAF) and the University of Bristol have been studying the exoplanetary system Kepler-107 through the Telescopio Nazionale Galileo in La Palma, Spain, an ideal location for observatories due to its remote island nature and mountainous height. Discovered by NASA in 2014, the Kepler-107 system doesn’t seem to be following the commonly accepted understanding of how a solar system works. The standard model is humanity’s own system: The inner planets are rocky and solid, outer planets are gaseous. This pattern, influenced by how close planets are to their star’s heat, creates another pattern: Planets drop in density as they’re further away from their star (although they pick up again when they get really far out and freeze solid). Kepler-107 doesn’t seem to be playing by these density rules. Kepler-107b, the second planet in the system, has a density similar to Earth. Considering how the Kepler-107 system has a star comparable to the Earth’s sun, that makes sense. But then comes the third planet in the system, Kepler-107c, which appears to be at least twice as dense as 107b, which is highly unusual. Scientists suspect that its density comes from 70 percent iron core. How’d it get there? Through an intensely violent head-on collision at the planet’s formation, although a series of smaller collisions is also a possibility. “Giant impacts are thought to have had a fundamental role in shaping our current solar system,” explains Bristol’s Dr. Zoe Leinhardt, a computational astrophysicist and co-author of the study’s paper, in a press statement. 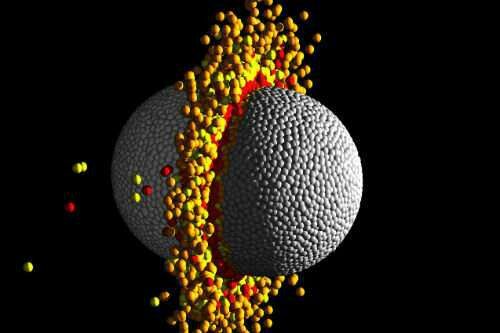 “The moon is most likely the result of such an impact, Mercury’s high density may be also, and Pluto’s large satellite Charon was likely captured after a giant impact but until now, we hadn’t found any evidence of giant impacts occurring in planetary systems outside of our own. There are similarities to Kepler-107c in our own solar system: Mercury, the closest planet to the sun, has a metallic core that covers around 85% of its body. Planet-sized impacts are suspected to have occurred in our own solar system as well. The origins of Mercury’s metallic core, for example, is still unknown. As recently as last year, scientists have theorized that a giant collision could have been responsible. The distant Kepler-107c, around 1,670 light-years from Earth, might be able to inform scientists about the formation of Earth’s nearby neighbor. When the European Space Agency’s BepiColombo mission finally reaches the tiny, hot planet, it might be able to answer questions that resonate throughout the universe.